A Biplane in GTA Vice City Stories. 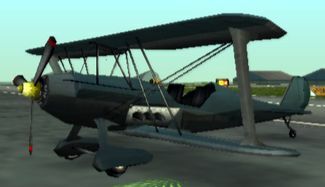 The Biplane is an airplane featured in Grand Theft Auto: Vice City Stories, serving as one of only two airplanes in the game, the other being the Skimmer. The Biplane's design is comparable to the Pitts Special-based Stuntplane from Grand Theft Auto: San Andreas, being similar in construction as the Stuntplane, but differing in terms of several designs, featuring a sharper nose, an open air cockpit, and a shorter rear stabilizer. The Biplane's maneuverability is inferior to the Stuntplane, being generally harder to steer, but otherwise possesses a fair speed while in flight. The Biplane can also sustain quite a bit of damage, but can still explode on impact if it crashes. At the end of the diagonal runway in Escobar International Airport after "From Zero to Hero". Triggers the Crims on Wings side mission when entered. When the camera is in cinematic mode, Vic can drive-by. In the BradyGames guide for GTA Vice City Stories, the plane is actually referred to "Pitts". It is unknown if the name was going to actually be on the based plane. This page was last modified on 24 August 2012, at 23:07.